The words low-carb and Italian don't necessarily sound like they should be said together, at least in my mind. 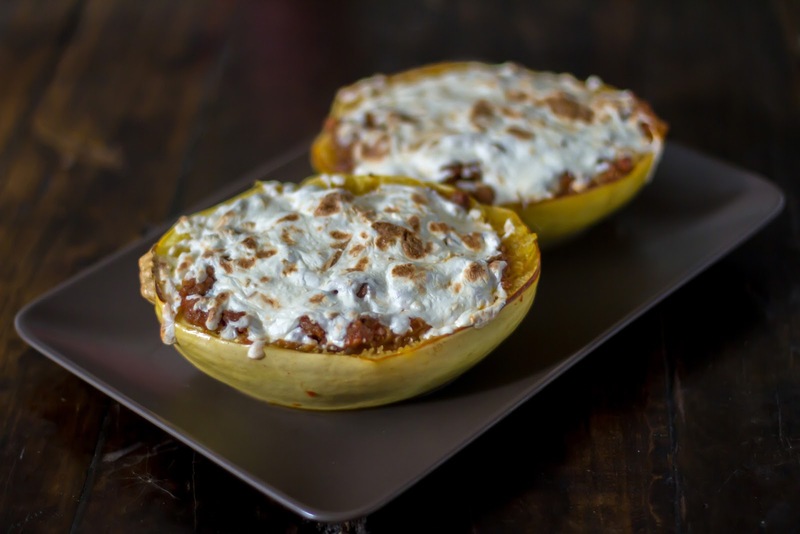 This time, though, spaghetti squash loaded with incredible local sausage, will give you all the Italian flavor you want in a low-carb package. Disclosure: I received products from MarWin Farm to facilitate a blog post. I received no other compensation for this post and the opinions contained herein, are my own and reflect my experience with the products. Your own may differ. Before I get into the recipe, I want to tell you about a fantastic local food find - MarWin Farm. They reached out to me and asked if I wanted to give their goods a try. After I did a little bit of recon, I responded with a big Y-E-S.
MarWin Farm, located in New Hartford, CT, specializes in duck, chicken and Berkshire pork (sometimes rabbit and other meats too). They have an on-farm processing facility that is licensed and inspected by the State of CT and the USDA. They also have a commercial kitchen that is licensed and inspected by the department of consumer protection in addition to a baker's license. They sell fresh meats from the field as well as sausages, pot pies, stocks, soups, pasta and ravioli from the kitchen. Plus, they offer farm smoked duck and chicken breasts. They feed their animals a special blend of feed made exclusively for them by Hiland Naturals. Hiland is part of the Non-GMO verification project and tests their ingredients for not only the presence of GMO ingredients but also the top 100 most common residual synthetic herbicides and pesticides. The folks at MarWinFarm consider it “Better than Organic” because of the testing program, which is lacking in the USDA Organic program. MarWin Farm is a member of the American Livestock Conservancy and the Slow Food Organization. While it's getting easier to find locally raised meat, it's still a bit of a challenge. MarWin Farm is working on changing that because, here's the icing on the cake, they deliver! Yup, if you live in the state of Connecticut, they will come to you. I don't know about you, but I think that's fantastic. They deliver on Thursdays, so you just place your order on their website before then. Your goodies will arrive at your doorstep in a soft-sided cooler bag. And, what I think is a very "cool" feature, is that your items aren't packed in ice, but rather frozen chicken or duck stock which you keep and use at no extra charge. To learn more about the farm and how it works, visit here: https://www.marwinfarm.com/products/. So, a couple of Thursdays ago I came home to find a cooler bag filled with roasted garlic and fennel sausages, smoked chorizo, cheesy biscuit chicken pot pie, smoked duck breast, a chunk of gruyere cheese, and my two chicken stock "ice packs". So far we've had the duck, pot pie, and sausage. The duck breast was smoked over hickory, garlic, and bourbon and preseasoned with Old Bay, cayenne, garlic, onion, dry mustard, pepper, and ginger. I seared the breast in a hot pan to crisp up the thick fatty skin and served it with roasted turnips (that I topped with the excess duck fat from the pan) and a cold broccoli salad. The duck was flavorful with a subtle smokiness. I am still thinking about the deliciousness of the chicken pot pie. Big chunks of dark meat chicken, with diced vegetables that weren't mushy, in a creamy, herb-filled sauce all topped with a light and flaky, cheesy biscuit. 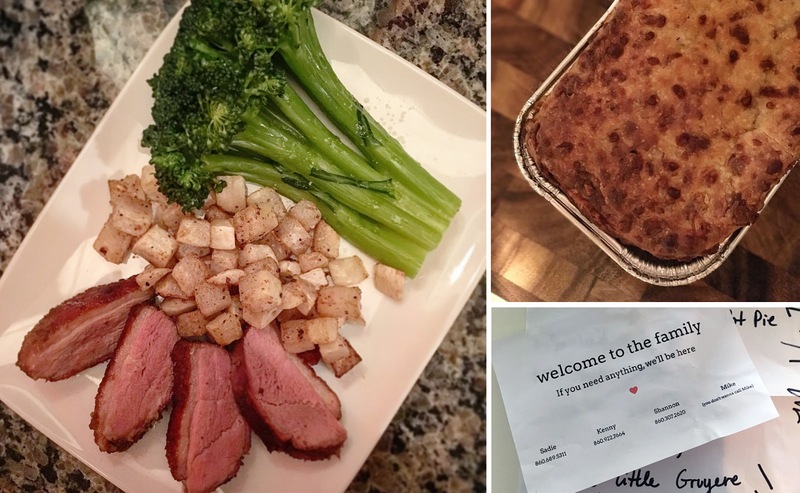 It was the perfect meal on a busy weeknight. All of this brings to me the ingredient that I can say hands down turned this spaghetti squash recipe into something special. The roasted garlic and fennel sausages were amazing. For this recipe, I removed the casings and was surprised to see whole roasted garlic cloves in there, not pieces, but whole cloves. It was an incredibly balanced blend of porkiness, fennel, and garlic. I think it is the best sausage I have ever had - local or otherwise. 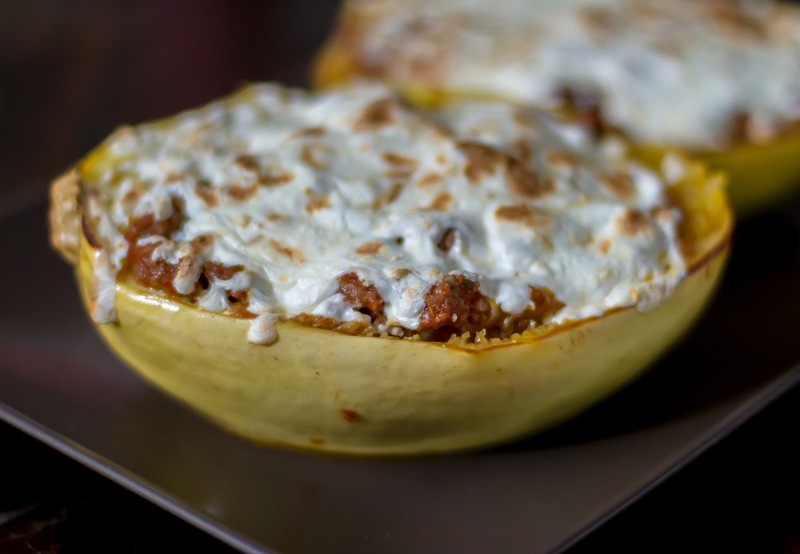 I am not the biggest fan of spaghetti squash, but I'm trying new recipes in hopes to find "the one." With the MarWin Farm sausage, I think this one is it. Rub a teaspoon of olive oil over each half and place cut-side down on the baking sheet. While the squash roasts, place a large saute pan over medium-high heat. Remove the casings from the sausage and add to the hot pan. Saute until browned and fully cooked. Add the diced onion to the pan and saute until translucent. Add the tomato sauce and bring to a gentle simmer. Turn the heat to low, periodically stirring ingredients around the pan so they don't burn. When the squash is done roasting, remove from oven and let cool about 10 minutes until it's cool enough to handle. Keep the oven on, but turn up the heat to 425° Fahrenheit. Using a fork, carefully scrape the flesh of the squash from side to side until it resembles spaghetti. Don't pierce or damage the skin. Stay tuned for another recipe featuring other goodies from MarWin Farm. Love the recipe! MarWin Farm sounds like a good endeavor to support. Thanks for sharing!